Great question and while every situation will be a little bit different you can safely wash cars, trucks and SUV's with light dirt accumulation. Vehicles with a heavy dirt accumulation, especially if they are not regularly washed or if there is visible mud caked onto the paint, should have the large accumulation of dirt first removed using a pressure washer or a strong spray of water. If you don't have access to a pressure washer or a free flowing source of water (a garden hose hooked up to a water spigot) then go to a do-it-yourself car wash.
You need clean, tall bucket such as one of our 5-gallon buckets. 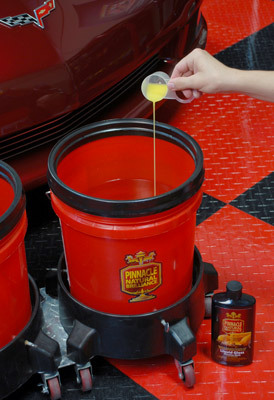 The most popular way to use a Rinseless Car Wash by serious enthusiasts is to use the Two Bucket Method. 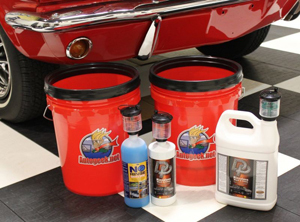 One bucket holds your Rinseless Car Wash Solution and the other bucket is filled with clean water and a Grit Guard Insert to trap any dirt and road grime you remove off the car at the bottom of the bucket. You can also agitate your mitt against the Grit Guard Insert to loosen and remove dirt out of your wash mitt. Most rinseless car washes on the market are mixed at 1 ounce per 2 gallons of water. You can use a measuring cup or check out this Pro Blend Bottle Proportion which makes measuring any concentrate quick, easy and accurate. The Pro Blend Bottle Proportioner comes in two sizes. 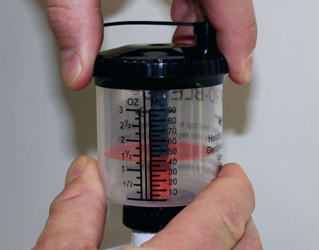 Simply attach the correct Pro Blend Bottle Proportioner to your bottle of concentrate and then adjust the regulator to the desired level. Next squeeze the bottle till the concentrate just fills over the top of the regulator. Then simply remove the small plastic dust cap off the Pro Blend Bottle Proportioner and pour the concentrate into your bucket of water. After you add the rinseless wash concentrate to the water stir to create a thoroughly mixed cleaning solution. Then add 4-5 gallons of clean water to your rinse bucket. Use this to rinse your wash mitt or sponge before reloading it with fresh cleaning solution. You can place a Grit Guard Insert, (Or 2 Grit Guard Inserts), into the bottom of your rinse water bucket to help remove dirt particles off your mitt and trap them on the bottom of the bucket. You're ready to use a rinseless wash to wash your car! The idea behind using a rinseless wash is to wash and dry one panel at a time. If you start out washing and drying a lower panel than the roof, then when you wash the roof you'll likely have cleaning solution running down and re-wetting a dry panel, which you’ve already washed and dried, causing you to have to dry the panel again or possibly wash and dry the panel a second time. So start at the top and work your way down. The idea behind using a rinseless wash is to wash and dry a panel or a section of a panel at one time. If you try to wash too large of an area before drying the cleaning solution can dry onto the panel. If you have a small panel to wash, like the hood of a Mini Cooper, then it’s small enough you can wash the entire panel and dry it before the cleaning solution can dry. If however you’re washing a Chrysler 300, you might find it easier to break the hood up into two halves and wash and dry one half at a time. The goal is to wet the panel, loosen any dirt or road grime and then wipe or blot the panel or section dry. Again, if a panel is too large you could risk having your cleaning solution dry before you have a chance to dry it with your towel. On warm or hot days, or in areas where there’s a strong air current or wind, these two factors can cause your cleaning solution to dry faster than in lower temperatures and no-wind environments. So take this into consideration when deciding how large of a panel or section of a panel to tackle at one time. The goal is to wash and dry the paint before the cleaning solution can dry on its own. Lastly, the wheels & tires. You may choose to use a brush instead of a wash mitt. Note: Air currents swirl around the rear of cars, truck and s.u.v. 's as you're driving at highway speeds and sometimes deposit an oily road film on to these rear, vertical panels. 2. Use a gentle touch and a dedicated wash mitt. When using a rinseless car wash, the idea is to carefully move your wash mitt over the surface only enough to loosen the grip any dirt or road grime has on the paint and then stop. It's also a good idea to have a speciality wash mitt just for this purpose. It's pretty common to see people washing their cars without thinking about what they're doing and pushing their wash mitt over the same section of paint dozens of strokes. In reality, one or two passes would have been sufficient. So focus on the task at hand and only make as many gentle passes as you deem necessary to loosen and dirt or road grime then STOP. 3. Place Ultra Soft Microfiber Rinseless Wash Mitt into your rinse water bucket. Place your wash mitt or sponge into your rinse water bucket until you've dried this section. The first thing you want to do after washing a panel, or a section of a panel, is to wipe the panel dry. To dry a panel off you can either wipe the panel dry or blot the panel dry. Either technique can be used. If you're working on a daily driver or getting ready to buff out the paint, then wiping is fine. If you're doing a maintenance wash on a car with an excellent finish or a car you've already buffed out, then you might consider the blotting technique with a light wipe afterwards. 5. Rinse your wash mitt and re-gather fresh cleaning solution. After you wipe the panel dry and you're ready to wash another panel, that's when you'll clean your wash mitt or sponge by scrubbing it against the Grit Guard Insert (this acts to extract dirt particles out of your mitt or sponge), and then wring out the excess water before gathering some fresh cleaning solution. Repeat the above process as you work your way around the car. When washing wheels and tires using a Rinseless Wash, instead of using your high quality wash mitts and/or sponges or even brushes, maybe consider using a microfiber or cotton towel from your tatty microfiber and cotton towel collection. 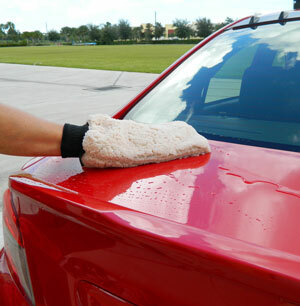 Preserve your fine buffing towels for the paint.